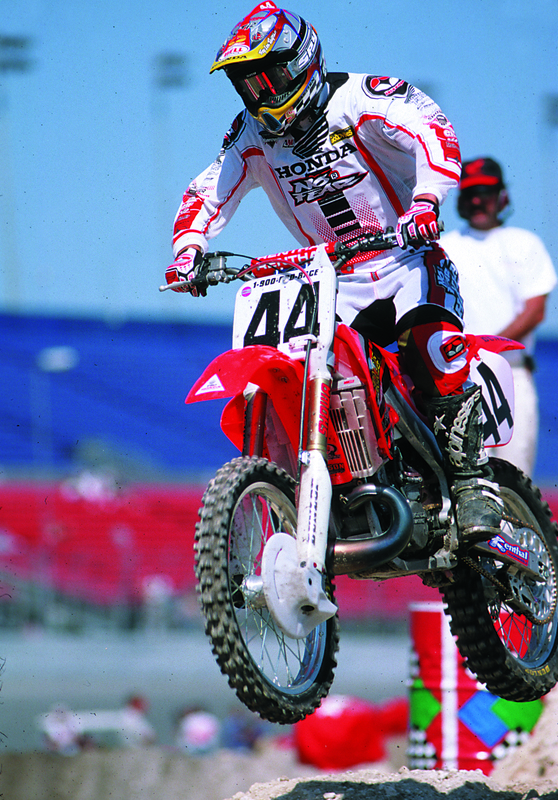 Sebastien Tortelli was one of few believers in the 20-inch front tire concept when he was at Team Honda. I bought a used 2001 Honda CR250 to race at two-stroke and vintage races, but it came with a 20-inch front wheel. What’s the deal? I never heard of a 20-inch tire. What are the benefits? Where can I get a new one? As a vintage guy, I think it would be neat to be the only guy with a 20-inch front wheel. The 20-inch front tire was not a new idea when it resurfaced in 1999 on the AMA National circuit. It had come standard several decades earlier on BSA bikes. Motocrossers have also tried to race with 19-inch and 23-inch front tires (the 1979 Honda CR125 came stock with a 23-inch front Bridgestone). Rear tires have also run the gambit of diameters. Many of today’s racers can remember when 18-inch rear wheels were the industry standard (and in the eyes of many racers, they never should have been replaced with the 19-inch). In 1977, the hottest craze on the GP and National circuit was 17-inch rear tires. Why? Footprint. The 17-inch rear wheel was stronger, had more air volume and offered a bigger footprint. Sound familiar? Oh yeah, the 17-inch rear tire had the same outer diameter as the 18-inch. The 17-inch tire came stock on many Husqvarna models and some Hondas, but it died out from lack of technological updates. Honda and Kawasaki made 20-inch front tires an option 18 years ago. Honda was the company that got the tire and rim manufacturers to build the 20-inch wheels. Honda asked Dunlop and Bridgestone to build prototype 20-inch front tires to see if the larger air volume could take the harshness out of the CR250’s aluminum frame. Unlike steel frames, Honda’s aluminum twin-spar frame was very rigid. This stiffness could not be dissipated by the CR’s suspension. Thus, Honda asked the Dunlop engineers what they could do to make the CR frames more absorbent. The answer was a larger front tire. Honda put its team riders on the 20-inch tires to get feedback. Some riders, like Sebastien Tortelli, liked the tires and raced with them; others had issues. Honda gave up on the 20-inch tire and decided to redesign its frame instead of using the big front tire to soften the impacts. Additionally, the 20-inch front tire was too limited. It climbed up ruts, squirmed in mud (and even on wet spots of a dry track) and thudded through sand whoops. It was best suited to hard dirt—dry, hard dirt. Eventually, the 20-inch front tire was abandoned to the dumpster of odd ideas. However, as of late, several tire companies have started making 21-inch Fatty front tires that are enlarged like the old 20-inch, but able to fit on a 21-inch rim. To read a test on the Hi-Point Fatty Click Here. The 21-inch Hi-Point Fatty (right) next to a standard 21-inch width tire. Here is a list of tech facts about the 20-inch front tire. Bigger not smaller: Although 20 sounds smaller than 21, it isn’t. Well, it is, but it isn’t. Although the rim is 1 inch smaller in diameter, the tire is considerably larger in air volume, sidewall height, weight and width. Thus, a 20-inch tire is slightly larger than 21. Wider as well as bigger: The 20-inch front rim is 1.85 inches wide, while a 21-inch rim is 1.60 inches. The wider rim spreads the tire’s bead out, changing the profile of the tire to produce a larger footprint. And that means more rubber on the ground. 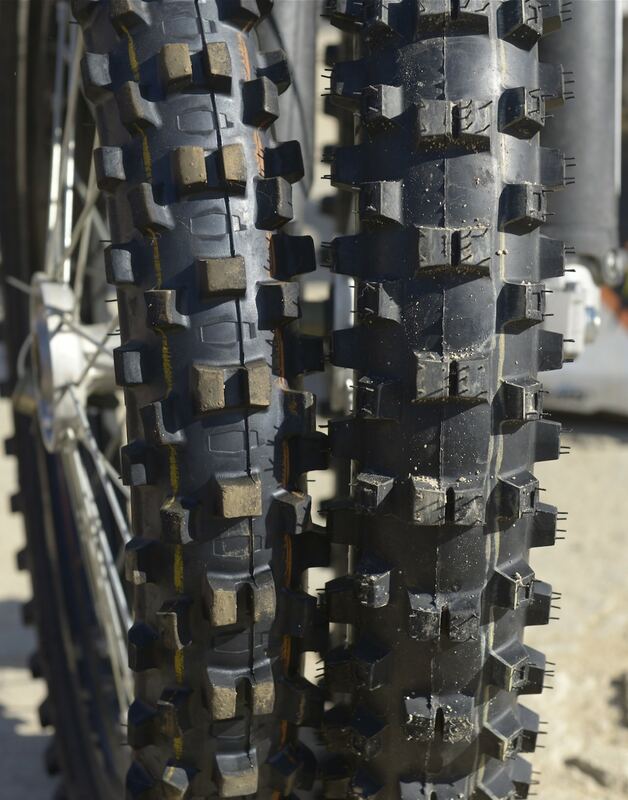 Bigger and wider but not taller: Dunlop’s 20-inch front tire is not as tall as the 21-inch tire it replaces. It is 14mm smaller in diameter, which means that the front end sits 7mm lower than with a 21-inch tire. For 2001, Honda outfitted its bikes with 7mm-longer fork legs. If you run a 21-inch tire, slide your 2001 Honda forks up 7mm. If you run the 20-inch tire, run your forks flush. Both Dunlop and Bridgestone were producing 20-inch front tires. The Bridgestone was a little taller than the Dunlop and did not require the 7mm adjustment. Here is a list of where the 20-inch tire worked better than the 21-inch tire. Cornering: Because adhesion is the prime ingredient of control, you can only go where you are pointed, and you can only be pointed when the tire is hooked up to the ground. The more rubber you can get in contact with the ground, the more control you have. This was especially true on hard-pack tracks, not so much on softer tracks. Square-edged bumps: When a 20-inch front tire hits a square-edged bump, the larger air volume of the big tire absorbs the hit to cushion the effect of the bump. Strength: A 20-inch front wheel is stronger than a 21. The smaller and wider rim is geometrically stronger than a larger one and, with the addition of shorter spokes (which flex less), the end result is a wheel that is less likely to explode, unravel or wobble. Here is a list of things that the 20-inch tire doesn’t do better than a 21-inch tire. Weight: It’s heavier. Test riders would switch back and forth the between the 20- and 21-inch and note the pendulum effect of the heavier 20-inch wheel. Ruts: In a rutted turn, a 20-inch front wheel would climb the side of the rut and often catch on the overhanging lip. Wet ground: On a track that had water on top of the ground, the 20-inch tire would slide. You would think that with its larger footprint it would be better on wet spots, but it was worse. The pressure on the narrower 21-inch tire’s knobs actually gripped better than the larger surface area but reduced pressure on the knobs of the 20-inch tire. Stepping out: Test riders noticed that the rear wheel stepped out more with the 20-inch front on a bike than with a 21. Perhaps this was because when the front grips better, the spinning rear can get loose more easily. This is most noticeable on flat turns and off-cambers. Our solution back in 2001 was to run a 120mm-wide, 19-inch rear tire. Sadly for you, no tire manufacturer sells a 20-inch front tire today. Your only choice is the internet used-parts market or switching to the stock 21-inch front tire.